Tugged between a mountain and a river was a Buddhist monastery headed by an old monk. One day, a new student approaches the monk. “Teacher, I want to be a Zen master, teach me”. The monk explains, “The pursuit of enlightenment entails a rigorous routine. To demonstrate you are cut for the training, you first need to compete and overcome three challenges”. The monk then calls all the students to the top of the mountain where there was a huge barn filled with haystack. He hands everyone an empty sack, each sack was of a different color. “The first challenge”, the monk instructs, “Go down to the river. On the riverbed there are thousands of colorful stones. Look for stones the same color as your sack, bring back as many as you can, and toss them in the barn. You have two hours on my stop-watch.. tic tic tic. Everyone rushes. The new student is fast. He dives into the river; picking up stones that matched the color of his sack. His sack fills at twice the speed of others. But there is still lot of time left, so he keeps stuffing more and more stones, then begins his climb back on the mountain. But alas, his overstuffed sack rips open and the stones go rolling down! He somehow manages to grab a few in his fist and is the last one to reach the barn right before the time runs out. The monk educates the student, “When we aspire too high, we lose perspective of the reality, and our dreams rip apart. Touching the sky, while feet on the ground– that’s not possible! The students rush again. The new kid realizes his chances were bleak since his colored stones were only a fistful. So any stone he scoops out, he keeps passing it over to whosever color it belonged to. Thanks to him, everyone ends up gathering more stones than they had scooped in previous years. Except for the new kid who comes out empty handed, and is thus disqualified from playing the next challenge. The monk educates the loser “When we give in too much to others, we become unfair to ourselves. Collaboration and competition – at the same time – is not possible! The teacher throws the final challenge to the rest of the team. “I am setting thirty minutes on my stop-watch, and then hiding it in the haystack. You have to retrieve my watch before the time runs out”. All students rush into the barn, but they fail to find the tiny watch in the huge barn. Just like the previous years, once again there was no winner. The teacher turns to the new student, “Success is like a needle in haystack, we need luck to find it. We can be as karmic as we want, but the hand of destiny is mightier”. The wise monk’s lessons apply well in our professional lives. Sure, when we enter the professional world, creating our own destiny with a dream to make our presence strongly felt sounds cool. Then reality hits us – hard and fast. We realize we are not unique. We are just one in a crowd. Flying is a far cry, there is no place to even move. Over here, what works is being practical, taking care of self, and then keeping our fingers crossed for good luck, good boss, good project. Doesn’t sound inspiring but that’s how it is. The sooner we get it, the sooner we make peace with our life. So let’s see if our new kid was sharp enough to pick up his lessons. The wise monk’s lessons have a wide applicability. Sure, creating our own destiny with a dream to change the world sounds cool. But in the real world, what works is being practical, taking care of self, and then keeping our fingers crossed for good luck. An uninspiring approach, but that’s the harsh truth – the sooner we get it, the sooner we are on our way to enlightenment. So let’s see if our new kid was sharp enough to pick up his lessons. A year passes by. The day of the competition arrives again. The bright student moves at a lightening speed as the first challenge begins. Only this time, he makes his round back to the barn without overfilling his sack, empties it, runs back and fills his sack again. Effectively, in two hours, he delivers two sacks instead of one, and thus wins the first challenge comfortably. Moral. The kid succeeded by pursuing his dreams in a practical way. Just like your Cybage, so practical that forget about setting long-term billion dollar goals, we don’t even set yearly growth targets! And yet fascinatingly our dream run just continues, including this year when the strongest of IT bellwethers have buckled. So how do we do it? Simple. Cybagians bring their dreams, and Cybage nurtures those dreams in its practical, scientific frameworks, and what churns out is an unbeatable partnership! The next challenge comes. All the students remembered the lesson from the previous year. To increase the number of stones they can gather, this time everyone starts handing over whichever color stone they will get hold of to the rightful owner. Because the bright kid’s stones were more in the barn, he walks out with the highest number of stones. Moral. Students knew too well they were competing against each other, just like all Indians who have a middle class upbringing. But here is the thing – Cybagians also understand if the playing field is fair, like in the barn, it is in our own interest to help each other win – so that the good ones do better, and not so good ones also do okay. It’s an all-inclusive winning where employees, employer and customers – all sides win! Look around – here is an organization that is celebrating its existence like a champion – in front of thousands of winning faces, and over there are our delighted partners who have specially flown in for this event –let’s give our special guests a round of applause! The old monk realizes the bright kid had a good shot at winning so decides to make the third challenge more difficult … he sends the kid all alone, without the team, into the barn to find his watch. And the kid comes back victorious within a few minutes. His teammates are stunned. “How did you do it”. “Simple”, the kid explains, “Because there was a pin-drop silence in the barn, I followed the tic tic sound of the watch to trace it”. So, was it luck that led kid to the watch? No! The kid would have found the watch every time he would have gone alone. That is how karmas work –Karmas are not a team event, but a solo performance. 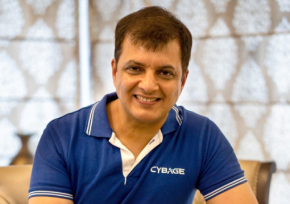 Just like the clock’s tic tic, karmas are the heart-beat of our life, it’s a life that Cybagians “bring to work” everyday, a slogan that our co-founding COO relentlessly championed, a culture imbibed in our DNA, to spread a smile on the face of a teammate, a customer, CybageAsha’s helpless villager or Khushboo’s poor student. Sure, karmas may not come back to us, but they definitely trigger good luck somewhere. Ask Cybage – it was your karmic connection that brought you here, but the one who got lucky in the process was Cybage! So the monastery finally had a winner! Then something strange happens. The old monk walks over to the kid and congratulates him for graduating from the academy, for having attained the status of Zen master. The old monk explains to other students – “The rigorous training in Zen is not for physical fitness, but for metaphysical fitness – the awakening of our three internal chakras … Head, Heart and Soul. Head bridges the sky and the ground – our dreams with reality. Heart is the rainbow that adds color in other people’s lives, without turning our own life into black & white. And soul beautifully weaves our karmas with somebody else’s luck”. And when thousands of such enlightened heads, hearts and souls are playing in symphony – an organization like your Cybage is born. And tonight, we will have the privilege of watching this symphony, the ocean of Cybagian spirit, as the Zen masters of Bollywood – Shankar, Ehsaan, Loy – take over in a few minutes. Good night & thank you for being Cybage’s head, heart and soul! I liked your speech overall….great thought….but particularly liked the Karmic Connection talk. I read it somewhere and kind of believe that in every birth of ours we meet a set of people and it is our karmic connection only that make us meet a set of people. I am happy to have karmic connections with you Arun. Would love to continue working with wonderful people here at Cybage. Great speech sir. Always thought provoking reading and listening to you sir! I believe in Karma, only as long as it does not have some theistic association(s) with it. it’s possible to explain Karma with the theory of probability combined with a specific attitude(or perspective). If I do good things for the environment around me, since the environment affects me heavily, chances are that, relatively good things will happen to me. And, if I’m really focused on doing good things, because of my positive attitude I would also start ‘noticing’ things which are relatively better. Otherwise, I don’t see there is any scientific mandate that Karma will come back to me, as it depends on how much impact my actions made to the environment around me. Here the gist of your talk makes sense to me that being practical is of utmost importance. Sir, I am a big fan of your speech content and delivery style and also of your stage performance. A great speech with a great message.